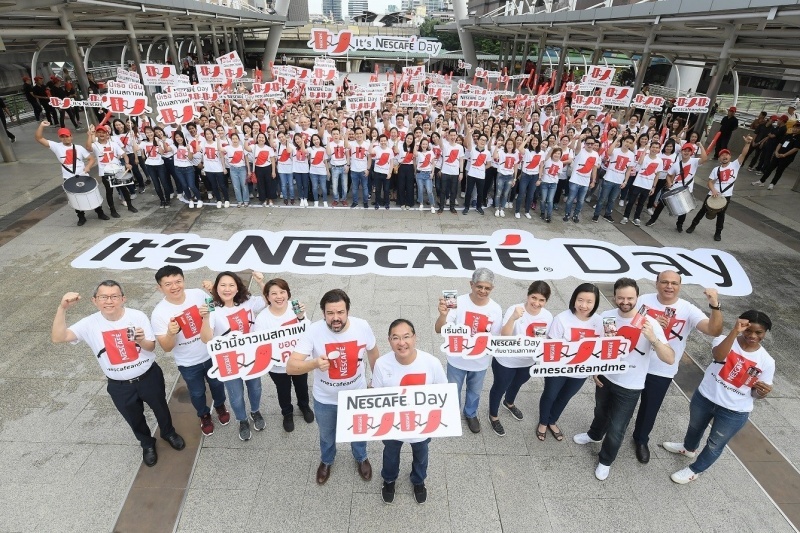 BANGKOK, Thailand — Nescafé successfully wrapped its Nescafé Day celebration which coincided with International Coffee Day on 1 October. Mr. Victor Seah, Chairman and Chief Executive Officer of Nestlé Indochina and Mr. Vladislav Andreev, Business Executive Officer – Coffee and Creamer Business Unit, Nestlé (Thai) Ltd, led the Nescafé troops handing out one million coffee samplings in 4 countries, i.e. Thailand, Cambodia, Laos and Myanmar, to celebrate Nescafé Day event. Three main products of Nescafé, including Nescafé Red Cup, Nescafé Can Ready-to-Drink and Nescafé Blend & Brew, were given away at popular spots in Bangkok, such as around Chong Nonsi BTS Station, Silom Road, Victory Monument and Asok Road, as well as several locations in major cities across the country. The Nescafé Day troops were well received by coffee lovers and those who passed by as they got to enjoy a fresh cup of coffee to start off their day from 7am onwards. The giveaway event was considered one of the biggest coffee-related celebrations and bonding treats ever been held in the four countries. To celebrate the International Coffee Day further, all proceeds collected from the sales at Nescafé Hub @ BTS Chidlom on October 1 will go to fund the education of Thai coffee farmers’ children in “Junior coffee Farmer” project. The project has been established by Nescafé to provide educational supports for local junior coffee farmers who are expected to become the future key assets in Thai coffee farming. It is also the result of Nescafé’s commitment to supporting the community to grow together with the business and encouraging the public to recognize the significance of coffee farmers.